For most of the post-war period, trade liberalisation was slow, involved only rich nations, and occurred only in the context of reciprocal bargains – multilateral GATT Rounds or regional trade agreements. The reciprocity was critical. Since foreign tariffs would fall only if domestic tariffs did, each nation’s exporters fought against the protectionists within their borders. In this way, governments found it politically optimal to cut tariffs that they had previously found optimal to impose (Moser 1990).1 Developed nations, who played reciprocally in the GATT, lowered their tariffs; developing nations who didn’t play reciprocally in the GATT – due to so-called special and differential treatment for developing nations – did not cut their tariffs. All this changed in the late 1980s. Developing nations that had previously eschewed all forms of liberalisation began to cut their tariffs unilaterally as seen in Figure 1. An explanation of why the shock makes a lower tariff politically optimal. Arguing that governments removed tariffs because they finally understood that free trade was in their nation’s own best interest is logically incoherent from an endogenous tariff perspective. I propose several mechanisms to account for unilateral tariff liberalisation and its timing (Baldwin 2010). The common theme is the impact that globalisation’s second unbundling had on developing nations’ incentive to obstruct trade with tariffs. Before turning to the mechanisms, a few words on the second unbundling are necessary as background. Globalisation is often viewed as driven by the gradual lowering of natural and man-made trade costs. This is a serious misunderstanding. Globalisation leaped forward with technical breakthroughs in two types of ‘connective’ activities, i.e. transportation and transmission. In the pre-globalisation world, production and consumption were forced together by poor transportation. The steam revolution (railroads and steamships) made it feasible to spatially separate them; scale economies made the separation profitable. This was globalisation’s first unbundling and trade theory was developed to understand it. The first unbundling, however, did not make the world flat. As production dispersed internationally, it clustered locally (factories). This happened since i) cheap transport favoured massive scale, ii) such production is complex, and iii) proximity lowers the cost of coordinating the complexity. In short, steam removed one constraint, but brought forward another – coordination costs. The connection between the internationalisation of supply chains and tariffs turns on the effective rate of protection concept, i.e. the fact that the protection of one stage of production depends upon the difference of the tariffs on the stage’s output and its imported inputs. This means that protection on downstream stages rises as upstream tariffs fall. As more intermediate goods became tradable, developing nation governments faced more pressure to cut tariffs on imported intermediates. The basic mechanism seems to be at work as Figure 2 shows. This rough intuition, however, is a long way from a fully worked out logical framework. The second unbundling revolutionised development options facing poor nations – especially those geographically close to industrial powerhouse nations like Japan, the US and Germany. Rather than building their own supply chains behind tariffs walls over a span of decades (as was done in the US, Germany, Japan, Korea and others), the second unbundling allowed nations like Thailand and the Philippines to set up sophisticated manufacturing facilities in a matter of months by joining a supply chain. The catch was that tariffs – and many other ‘pro-industrialisation’ policies from the pre-ICT era – turned out to be hindrances to joining supply chains. In reaction, many developing nations dropped the old policies to attract offshored manufacturing jobs and investment. This is the first mechanism I highlight, and it is an elaboration of an idea in Kojima (1975). The second mechanism focuses on the death of infant-industry industrialisation strategies. In the 1960s and 1970s, many developing nations (especially in East Asia) pursued dual-track industrialisation strategies (Ando and Kimura 2005). Import substitution that encouraged the development of the full supply chain behind tariff barriers. Export processing activities where the nation’s low-cost labour was used by multinational corporations to lower the cost of their components. As production unbundling proceeded, and the offshoring of segments of the value added chain spread, the relative competitiveness of infant-industry goods were undermined. In essence, developing nations’ participation in the international supply chains of multinationals undermined their own competitiveness in final goods. To put it differently, observe that before unbundling, manufacturing involved a collection of labour-intensive stages and knowledge-intensive stages. This bundling tended to mute comparative advantages. Competitiveness of the, say, Japanese carmakers was hindered by the fact that labour-intensive stages had to be done by high-wage Japanese. When production unbundling became possible, the cost of the Japanese production fell since offshoring allowed Japan to borrow elements of developing nation’s comparative advantage in labour-intensive activities. Importantly, this was not mutual. The developing nation automakers did not enjoy a corresponding ‘borrowing’ of Japan’s comparative advantage in knowledge-intensive stages. The net result is that production unbundling heightens the rich nation’s comparative advantage in final autos. As far as the mechanism is concerned, the key point is that the shift in competitiveness tended to raise the political-economy cost of infant-industry protection in two ways. By lowering the world price of cars, offshoring raised the domestic welfare costs of any given level of final good production. If developing-country carmakers hoped to maintain their competitiveness, they would have to purchase components from the lowest-cost source rather than favouring local parts makers created by infant-industry policies. The first put pressure on final tariffs, the second on parts and components. Given the recent availability of tariff data, unilateral tariff liberalisation would seem to be an area with lots of ‘low-hanging fruit’ for researchers. But the race is on. My favourite entry is Vézina (2010). •Ando, Mitsuyo and Fukunari Kimura (2005). “The Formation of International Production and Distribution Networks in East Asia”, in T. Ito and A. Rose (eds) International Trade in East Asia, NBER-East Asia Seminar on Economics, Volume 14, pages 177-216. •Baldwin, Richard (2006). “Globalisation: the great unbundling(s)”, Chapter 1, in Globalisation challenges for Europe, Secretariat of the Economic Council, Finnish Prime Minister’s Office, Helsinki, 2006, pp 5-47. •Baldwin, Richard (2010). “Unilateral tariff liberalisation”, in The International Economy, Journal of The Japan Society of International Economics, No.14, pp 10-43. 2010. Also NBER WP 16600, 2010. •Baldwin, Richard (2011). “21st Century Regionalism: Filling the gap between 21st century trade and 20th century trade rules”, CEPR Policy Insight 56, May. •Blackhurst, Richard (1979). “Reciprocity in trade negotiations under flexible exchange rates”, in John Martin and Alasdair Smith (eds) Trade and payments adjustments under flexible exchange rates, London: Macmillan, 1979. •Cooper, Richard (1971). “Tariff issues and the Third World”, The World Today, Chatham House publication, September. •Grossman, Gene and Elhanan Helpman. “Protection for Sale”, American Economic Review, Vol. 84, No. 4. (Sep., 1994), pp. 833-850. •Grossman, Gene M & Helpman, Elhanan, 1995. “Trade Wars and Trade Talks”, Journal of Political Economy, University of Chicago Press, vol. 103(4), pages 675-708, August. •Moser, Peter (1990). “The political economy of the GATT”, University of St.Gallen PhD thesis. St. Gallen. •Roesseler, Freider (1978). “The rationale for reciprocity in trade agreements under floating currencies”, Kyklos, Volume 31, Issue 2, pages 258–274, May. •Vézina, Pierre-Louis (2010). 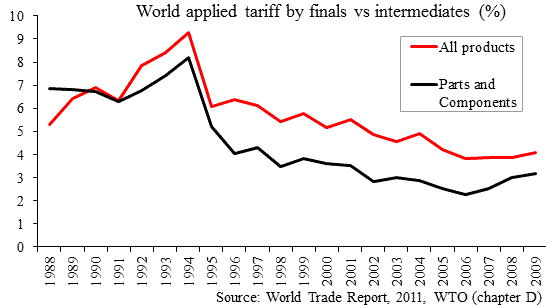 “Race-To-The-Bottom Tariff Cutting“, IHEID Working Paper 12-2010, July 2010. 1The political economy logic of reciprocal liberalisation has long been understood. Cooper (1971 p.410) wrote: “The principle of reciprocity is designed to hold out the promise of export gains to certain sectors of the economy, and thereby to establish a counterweight to those who will be hurt by increased imports. Reciprocity attempts to build pluralistic support for tariff reduction.” Well known to trade negotiators, this point was surely not novel to Cooper and many have made it subsequently including Roesseler (1978), Blackhurst (1979), and Baldwin (1980). For an early formal treatment see Moser (1990), or Hillman and Moser (1992). Cooper’s basic point was brought to the attention of the broad community of trade scholars via the Grossman and Helpman (1995) parameterisation. 2In the economics literature, most discussions of unilateralism consist of practical accounts of how and why various nations undertook such measures (e.g. Garnaut 1991, Young 1996, Edwards and Lederman 1998, Richardson 2001, and Sally 2008). The political economy theories that account for unilateralism include Coates and Ludema (2001), Krishna and Mitra (2008), Ludema, Mayda and Mishra (2010), and Conconi and Perroni (2010). 3See Baldwin (2006) for the original presentation of the ideas and Baldwin (2011) for more recent extensions.